At just before 9pm Central European Time on 26 November, Mars received a new visitor: NASA’s InSight lander. Short for Interior Exploration using Seismic Investigations, Geodesy and Heat Transport, InSight will be the first Mars mission dedicated to studying the planet’s interior, including sensing Mars quakes. Learning about the interior of the planet will inform scientists about the early formation of the rocky planets in our own Solar System, as well as the evolution of exoplanets orbiting other stars. Since InSight’s study is focused on sensing the planet’s interior, surface geology is not such an important factor in deciding the landing site as it is for other missions. Therefore, it is targeting a flat, stable surface in the Elysium Planitia region, which is captured in this wide field view from ESA’s Mars Express Visual Monitoring Camera taken on 29 February 2016 (click here for a labelled view). InSight will target a landing site centred at 4.5ºN/135.9ºE, about 600 km from Gale Crater, the region that NASA’s Curiosity rover is exploring. 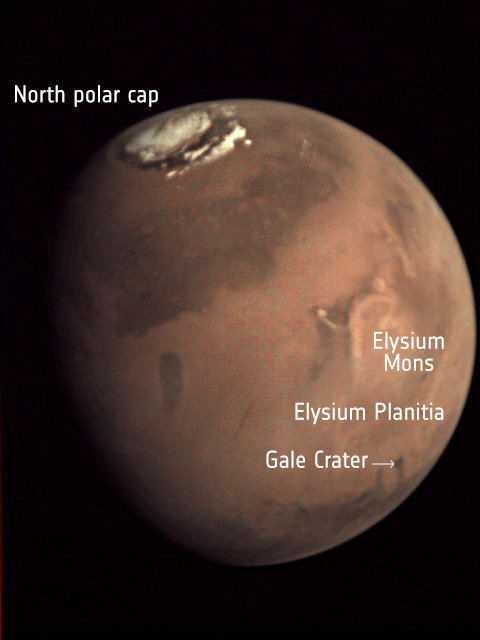 In the image shown here, Elysium Planitia is located roughly between the dark features at the bottom right (which includes Gale Crater), and the brighter arc-shaped feature above, to the right of the centre of the image, which is the location of volcano Elysium Mons. The north polar ice cap is seen at the top of the image. ESA has already been supporting InSight’s mission with its ground station network throughout the cruise to Mars, following the mission’s launch in May 2018. The joint ESA-Roscosmos Trace Gas Orbiter (TGO) of the ExoMars mission, which arrived at Mars in October 2016, is ready to support data relay from InSight several times per day once it has landed safely, as required. Mars Express will also be prepared to support, on NASA’s request, ad hoc relay contacts with InSight in case of emergency needs. TGO will also act as a data relay for the ExoMars rover mission in 2021, for which the landing site was recommended earlier this month as Oxia Planum. A region that is thought to have hosted vast volumes of water in the past, it is an ideal location to search for clues that may help reveal the presence of past life on Mars. NASA also just announced the landing site for its Mars 2020 rover, which is set to explore an ancient river delta in Jezero Crater. Moreover, the rover will collect rock and soil samples and store them in a cache on the planet’s surface. NASA and ESA are studying future mission concepts to retrieve the samples and return them to Earth, setting the stage for the next decade of Mars exploration.